Ah, fall. The air is brisker, days are getting shorter, pumpkin spice-flavored things are hitting the shelves... and a new season of The Walking Dead is almost here. Season 8 recently became available on Netflix, but if you don't have time to binge it before the ninth installment begins on October 7, we've got you covered. See Rick, Michonne, and the rest of the gang in the future timeline. Read on for need-to-know info that'll get you caught up on AMC's zombie phenomenon. First and foremost, the central thread of the past several seasons — the "All Out War" with Negan and the Saviors — has unraveled. Rick Grimes has won a decisive victory against the bat-wielding baddie and his minions, a battle that certainly came with a higher cost than he'd anticipated when he first attacked the Saviors' outpost in Season 6. Despite cutting Negan's throat and letting him bleed out, Rick decided to save his former rival and stick him in a cell in Alexandria, honoring Carl's wishes and staying true to the comics. When we pick up, that's (presumably) where we'll find Negan. In the final moments of Season 8, several major players made their discontent with Rick's decision known, and vowed...revenge? Justice? To keep fighting? A heartbroken Maggie tried to get Rick to avenge Glenn when the Saviors' leader was in their clutches, but he allowed his mercy to prevail over his wrath: now Maggie's the one with rage, directed at Rick and Michonne. She, Jesus and Daryl met at the Hilltop in the final moments of the season, vowing to bide their time and "show them" when the time is right. Is Season 9 about to become The Walking Dead: Civil War? Plus, Andrew Lincoln talks leaving. By far the biggest loss in Season 8 — and perhaps the show as a whole — was the devastating farewell to Carl Grimes in Season 8's "Honor," which saw Rick Grimes' only biological child succumb to a bite wound. Carl used his final moments to share his vision of how he thought the world should be after All Out War, and asked his dad to choose mercy over wrath and let the Saviors become members of the larger community. Rick heeded those words and kept Negan alive. After two seasons of living life as "Negan," Eugene's finally found his way back to the right side. Though not exactly playing a long con as many fans had hoped, the doc turned into the good doc when it counted: his backfiring bullets put the Saviors out of commission during the final battle, and let Rick have a relatively clear path to Negan. 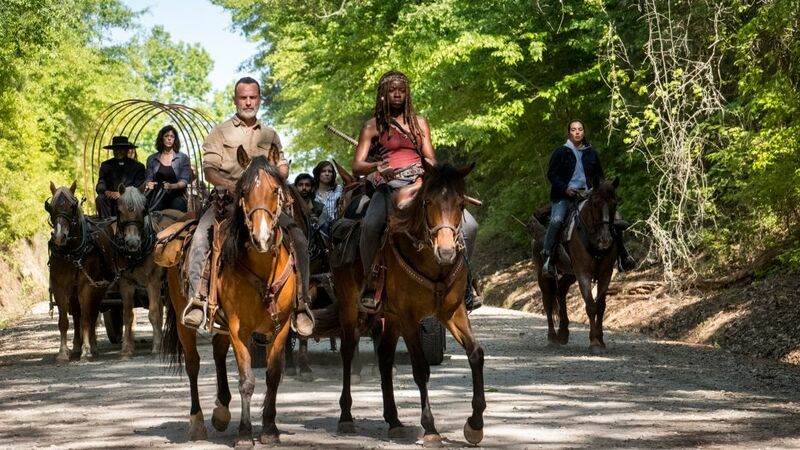 The Comic-Con trailer showed him on a run with Rick and the rest of the gang, so it seems any bad blood has been washed away when Season 9 picks up. Other changes in "the group" include Father Gabriel's blindness after becoming infected after using walker blood to escape from a trailer in the Saviors' compound, Tobin's death at the Hilltop and Dwight's departure to find his wife, Sherry. A more peaceful world awaits... or does it? With Rick's promise of forgiveness in the final episode, and in accordance with Carl's wishes, many of the Saviors have been allowed to join the larger collective society our protagonists have built. A surprising addition includes Jadis, the last surviving member of the group who lived in a trash heap and allied with Negan in Season 7's final battle — then were exterminated as the late Savior Simon went against his boss's wishes. At the Hilltop, some of the captured Saviors have been attempting to prove their worth, none more diligently than Alden, a puppy-eyed idealist who seems to have a crush on Maggie. Callan McAuliffe, who plays him, has been promoted to a series regular, so it seems likely we'll be seeing more of Alden this season. When Rick and co. show up on October 7, they'll be 18 months older than they were at the end of Season 8. During that time, it seems quite a bit has changed; Rick's trying to get the Saviors to integrate into the Alexandra-Hilltop-Kingdom-Oceanside conglomerate, roads have further broken down and gas is scarce, leading the group to travel on horseback and romance has blossomed between Carol and Ezekiel. Perhaps the most controversial aspect of Season 9 is Rick Grimes' impending departure. AMC is even advertising Season 9A as "Rick Grimes' Final Episodes," so if you were holding out hope for Andrew Lincoln to have a last-minute change of heart... it doesn't look likely. Lincoln will be appearing in only a handful of episodes at the beginning of the season, and there's not much word about whether or not the former sheriff survives past those. Have you ever wondered what your former favorites are doing now? Click through our gallery to find out! Rick isn't the only familiar face who won't be around as often as fans might like. Maggie's screentime will be reduced as a result of Lauren Cohan's ABC series, Whiskey Cavalier, picking up a series order and leaving her with less time to run around and kill zombies. It'll be interesting to see how the show navigates the loss of these two central characters. Maybe one of them gets on that mysterious helicopter? The Walking Dead headlines in your inbox as we publish them.